It appears that transportation troubles were avoided on the second night of the Ultra Music Festival. 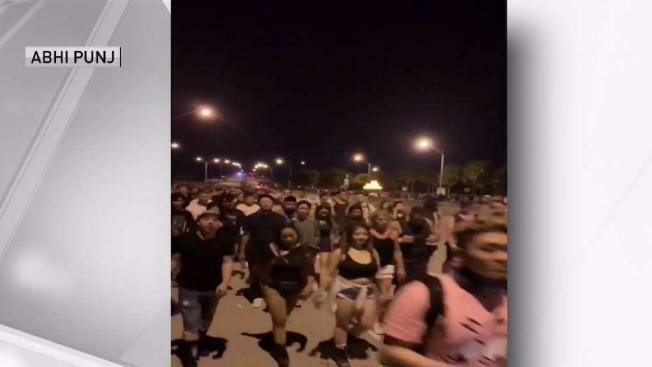 A tree caught fire, shuttles shut down and festivalgoers walked for miles to leave Ultra Music Festival. Two days left. Ultra organizers held a press conference Saturday morning to address the "logistical problems" that occurred after the Friday festival ended early Saturday. On Twitter, #FyreFestival2 has been one of the most popular hashtags in South Florida – mostly posts complaining about the transportation meltdown and sarcastic remarks by people who were not surprised about what occurred. Fyre Festival is notorious as a failed event heavily promoted on social media that promised upscale accommodations, gourmet food and distinguished headliners at an exclusive location in the Bahamas. It didn't quite happen like that in the Bahamas as revelers' expectations were met with cheese sandwiches, rudimentary lodging and the lack of attendance by famous people – not to mention being stranded for hours on end. In Miami, however, the large-scale problems were limited to the first day's end. Seemingly endless posts on social media criticize the Ultra festival organizers for not preparing adequately for the tens of thousands of people who flooded Virginia Key. There's only one way in or out of Virginia Key by land: the Rickenbacker Causeway – unless you bought a three-day ferry pass costing $150 to travel by sea. "Many of you experienced challenging transportation conditions leaving the festival," Ultra said in a statement. "This is unacceptable and inconsistent with the high standards you have come to expect from us. For this, we are sorry." Thousands of people attempted to leave on the designated shuttles at the same time – waiting hours. Other thousands of people wanted to walk the three miles across the bridge to reach taxi/ridesharing pick-up points on the other side. According to numerous accounts of the events on social media and in local reports, shuttles shut down due to mass confusion and disarray. One Twitter user wrote that arriving at the festival was easy. Leaving was "TERRIBLE." People were "banging on the buses begging to just let people in." "We probably watched 20 buses pass us with absolutely no one in them," the Twitter user wrote. "It was straight chaos." Officials anticipated tens of thousands of people to join the party scheduled from Friday to Sunday featuring high-profile artists such as Marshmello, David Guetta, deadmau5 and Afrojack. The festival welcomed millions over the years to downtown Miami's Bayfront Park until commissioners voted against a contract to retain the festival at that location – opting to relocate it to Virginia Key, instead. Ultra organizers posted their game plan for the rest of the weekend on Twitter. They said they have allocated additional resources and additional training for all transportation staff and volunteers. Additionally, they have added new transportation information at each shuttle hub and around the festival grounds. Organizers say they also improved infrastructure around the bus loading process. Lastly, organizers encouraged festivalgoers to stick around and hang out. They are adding "post 2-am activities including extended food, drink, and merchandise vendor hours, art installations, secret performances, and other attractions." Also, though it's not clear how it occurred, a tree caught on fire. Ultra Music Festival chief of security Ray Martinez said the fire was a small brush fire that was quickly put out without damage or injuries. Though some festivalgoers suggested fireworks started the fire, Martinez said the cause is not yet known. The transportation issue originated when people began leaving early and buses were not prepared – a problem that compounded as time went on, according to Martinez. "We recognize we have to make adjustments and improve the way our plan is working," Martinez said. "We're hoping for, again, a fabulous show on day two and, obviously, improvements in our transportation plan as we learn from being here on a new site on how to make the adjustments and move forward." Organizers met with police and fire department officials overnight to discuss how to prevent a similar situation on the second day. More than 55,000 people attended the first day that ran from 5 p.m. Friday until 2 a.m. Saturday, according to Martinez. The last people to get off the island left just before 5 a.m.